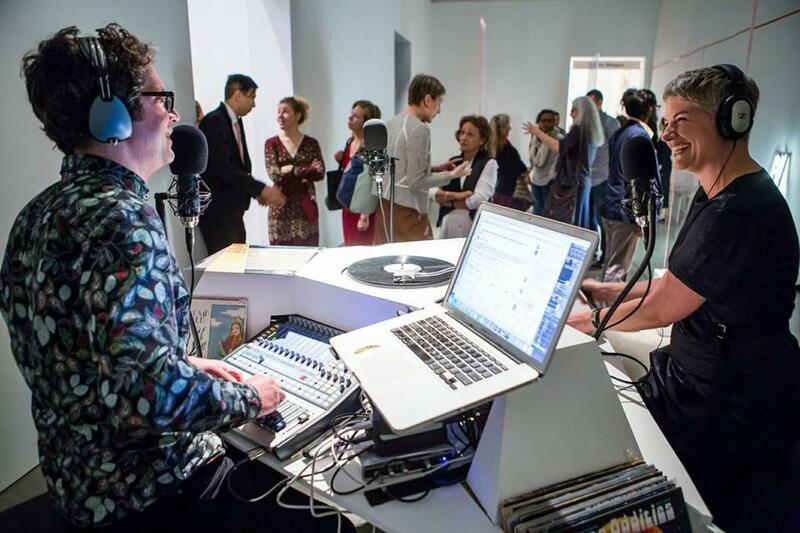 Earlier this week, a radio DJ manned his microphone in one gallery of the Institute of Contemporary Art. Two performance artists created works simultaneously in nearby galleries. And, oh yeah, there was also visual art on display. All were part of the 2015 James and Audrey Foster Prize exhibition, the ICA’s biennial showcase of Boston-area artists. The ICA has made a smart, if risky, move by focusing this year’s Foster Prize on performance art and artist collectives. In addition to a quiet appreciation of aesthetics, museums are increasingly manufacturing experiences — something fleeting that you can photograph and post. This show pushes that envelope. Experiential art is exciting for viewers and it builds audiences, but it’s demanding on the staff, and when it’s all happening at once — as it did at the Tuesday opening — it can be overwhelming. Luckily, the rest of the schedule has a little more air in it. This year’s winners — Ricardo De Lima, Vela Phelan, Sandrine Schaefer, and the collective kijidome — will all be changing things up, with new performances, a second exhibit from kijidome, public interventions, and more. Almost everything in the Foster Prize show today will be different two months from now. Works in Foster Prize exhibitions can be more competitive than conversant with one another, to the detriment of all. That’s the case here – Schaefer and Phelan are both performance artists, but that doesn’t mean they belong on the same bill. Although the artists have similarly nimble practices, there are jarring thematic gulfs. Best to take each as a small solo show. 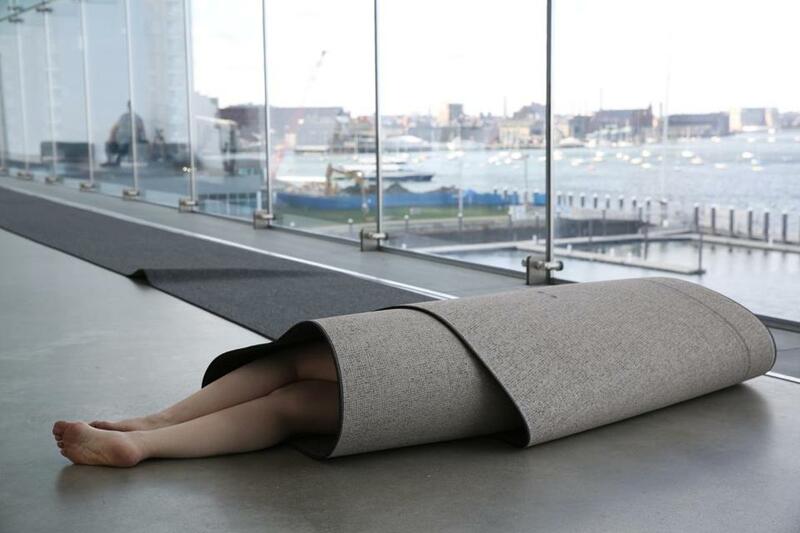 Schaefer’s first durational performance, “Acclimating to Horizontal Movement,” took place Tuesday in the John Hancock Founders Gallery, the hallway with the spectacular harbor view. She had rolled herself up in a long carpet, and over the course of six hours, rolled back and forth until she arrived at the end of the hallway and emerged like a butterfly from its chrysalis. What I saw of it was lucid, lyrical, and affecting. Schaefer’s naked legs protruded from one end of the carpet; her hair spilled out the other end. It was a comical scene, and it captured the incremental back-and-forth of existence. Playing out against the backdrop of the harbor, her motion echoed the water’s, and the long horizontal thrust of her performance traced the horizon line. Over time, Schaefer will do more performances, leaving remnants behind. If you’re not there when she is, you’ll get a whiff of the scope of her project. But it’s worth going to see her in person (a full schedule is at www.icaboston.org). The performance “I. Obscurus Conventus,” from Vela Phelan’s “Obscurus Fidem” installation at the ICA. Meanwhile, Phelan’s installation “Obscurus Fidem” stands on its own. 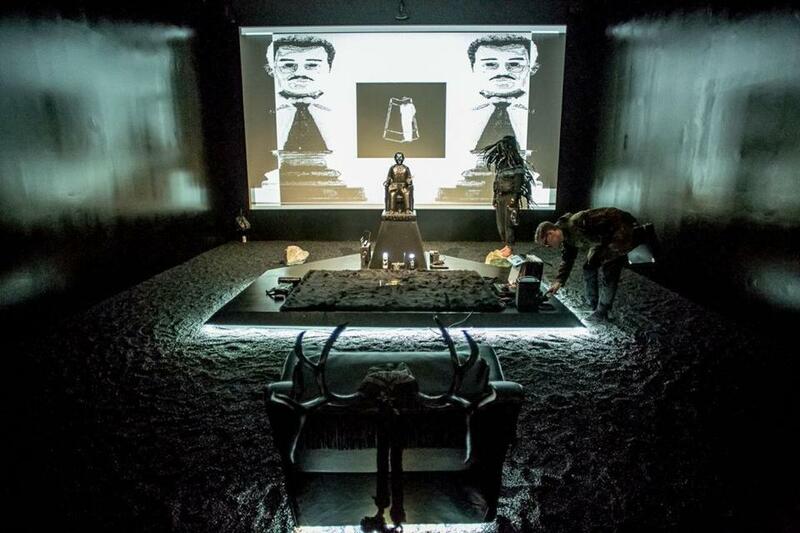 Walk into the blackened gallery and you’ll find gravel on the floor, a large-scale video projection, and a shrine to Jésus Malverde, a folk legend elevated to sainthood by Mexican drug runners. Phelan has long investigated the intersections of kitsch and faith. Throwing Malverde into the mix, he raises tough questions about morality and spiritual life. His work has a labyrinthine quality. It must be navigated, whereas Schaefer’s performances can simply be watched. For his first performance, “I. Obscurus Conventus,” Phelan donned a feathery black mask and tended the altar. A single performer can galvanize attention, but he purposefully came across as secondary to the space itself. In future performances, he will take a more principal role, for instance carrying a Malverde statue up a mountain of trash — a fitting mount from which to give a sermon about a figure worshiped by drug traffickers. In a corner of De Lima’s gallery, DJ Jesse Kaminsky invited viewers to chat on WFMU, a New Jersey radio station live stream. Simple as that, the museum, which can feel cloistered, reached out with immediacy to the world. De Lima will be programming music, film screenings, and more throughout the Foster Prize exhibition; he and kijidome come to the exhibit more as curators than as artists. De Lima has used tape to quote the floor plan of the Chinatown space where he launched his nomadic performance program, “Spectacle Boston.” He chopped up the gallery with large sheets of clear acrylic mounted on concrete blocks — part sculptures, part grounds for display. Presumably, he’ll use these to install art, starting with work by Sweety’s, a collective, this month. For now, the gallery is a blank slate. Kijidome’s exhibit explores transience and limbo. The collective (artists Sean Downey, Carlos Jiménez Cahua, Lucy Kim, and Susan Metrican) has a South End space that shows smart, edgy art, and its first ICA effort mostly reflects that aesthetic. But some of it is too smart. “Events From ‘The Tea-Garden Journal’ ” by Jesal Kapadia with friends, a wall-size collage of digital printouts, would work better in a book format, and even then, some of the text is off-putting and intellectually coy. But Nicholas Sullivan’s delirious hot-pink “Freaks” sculpture, all jutting lines and hard angles, is wonderful, spiky yet frothy. Josue Pellot's “1493,” a series of neon pictures, depicts violent encounters between Native Americans and European conquistadors. They look like trading cards, but they’re loaded with lost history and pathos. John Andress, the ICA’s associate director of performing arts, and senior curator Jenelle Porter have reached into a deep well of creativity in Boston with this show. What they’ve pulled out is wild and unwieldy. Much of it — particularly De Lima’s work – is hard to gauge yet. Kudos to them for getting it out there. DJ Jesse Kaminsky with viewers in Ricardo De Lima’s gallery at the ICA.